From Asian-influenced and Greek to Indian and pizza-inspired, there are flavors from around the world waiting to be incorporated into your favorite tortilla. Everyone loves burritos, but sometimes a little change is necessary. And by “change,” we mean burritos that aren’t filled with just beans, rice, guacamole, and salsa. 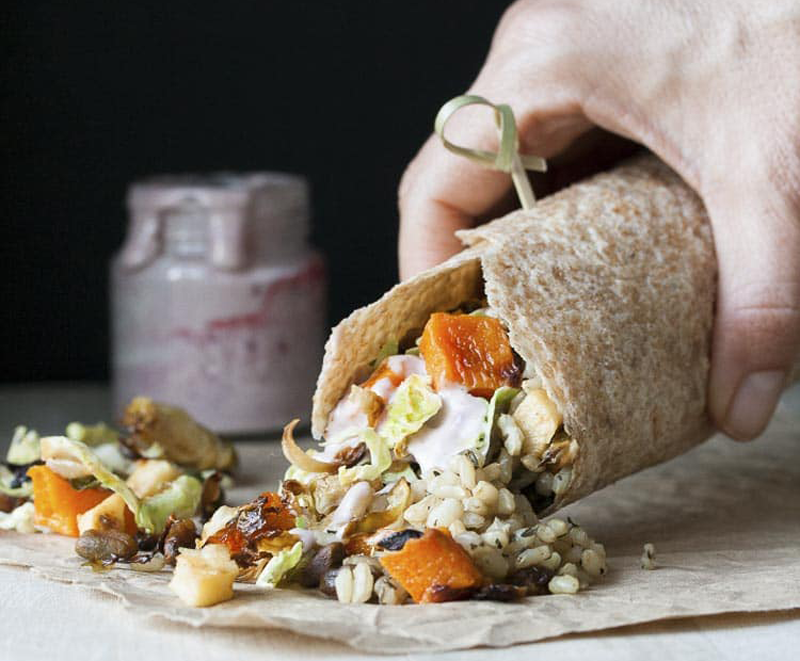 With this in mind, we’re highlighting seven plant-based burritos that’ll make you rethink how to approach your next burrito experience. Similar to a samosa but in a burrito package, this recipe from Oh My Veggies is a great way to use leftover Indian food in an inspired way. Using coconut basmati rice, cauliflower, chickpeas, and a heavy dose of spices, this dish comes together quickly and satisfies all of your Indian food cravings. 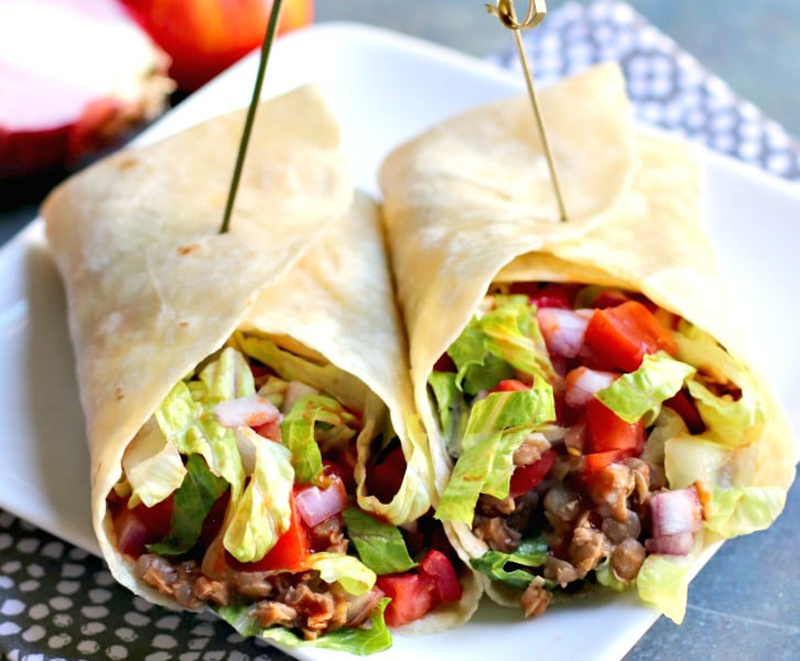 Veggies Save the Day’s Greek burrito is much like a gyro but with tortilla instead of pita. 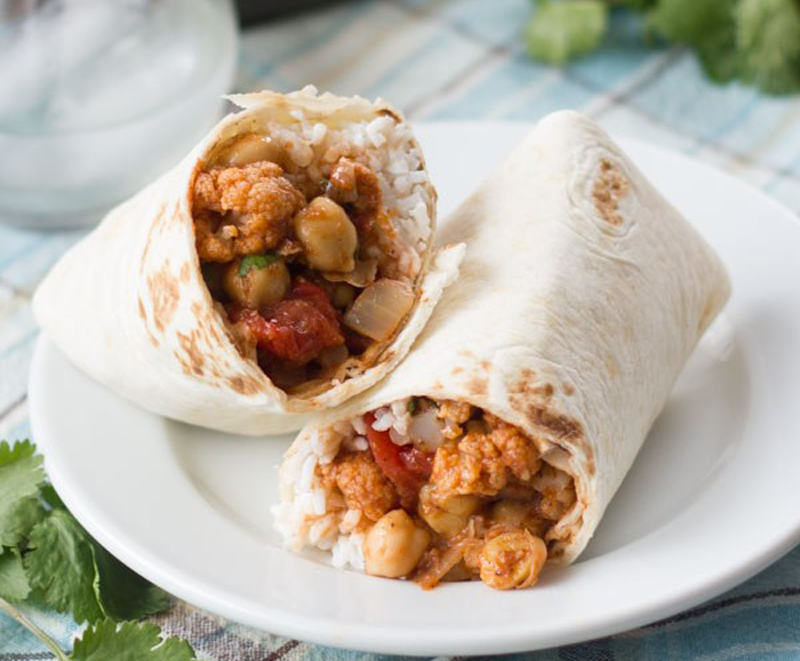 This recipe features “traditional” burrito ingredients such as lettuce, tomato, and red onion, but the “meaty” bean/nut mixture made by combining lentils, chickpeas, and walnuts with tomato sauce and spices is what gives this meal its Greek influence. 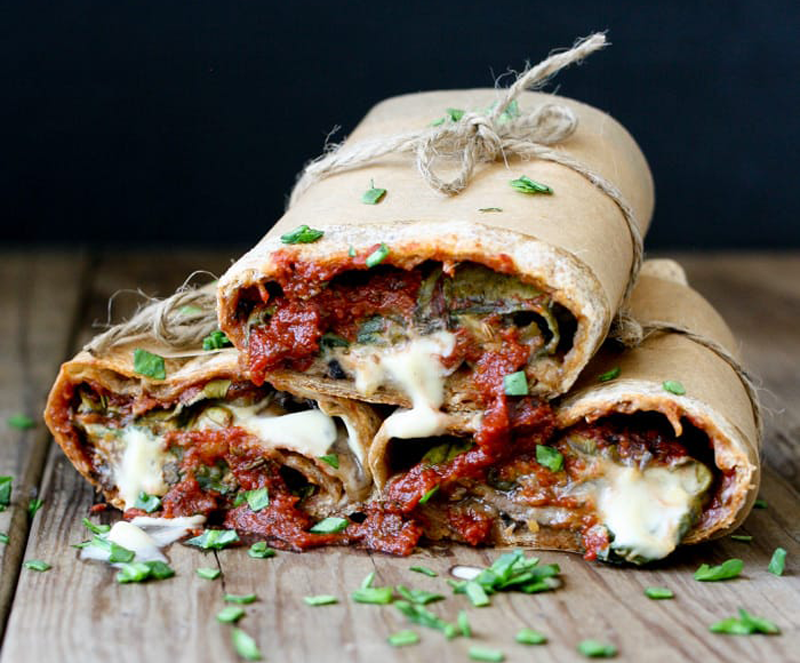 As if we needed more reason to eat pizza, Veggies Don’t Bite has provided us with this simple recipe for a pizza burrito. In its simplest form, the dish combines pizza sauce, spinach, mushrooms, cream sauce, and sausage crumbles before baking in the oven. 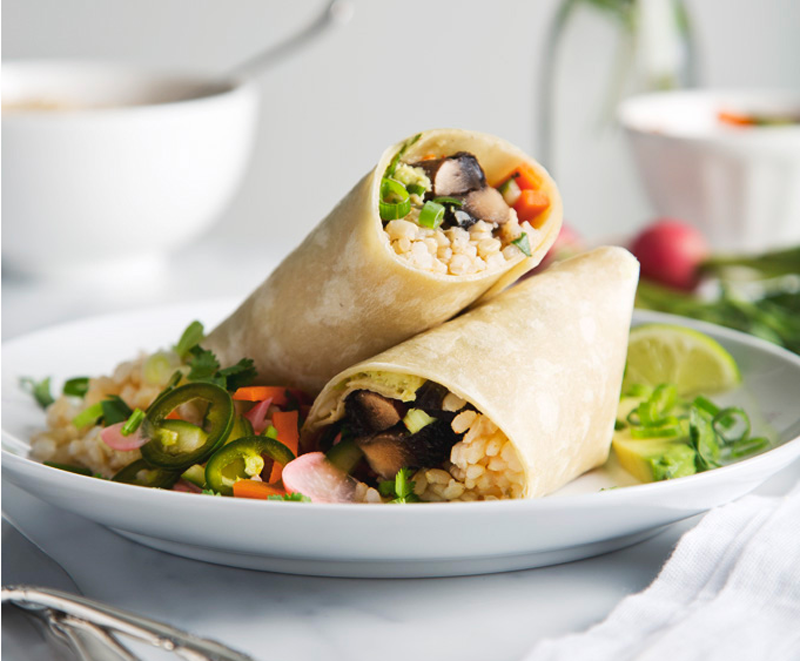 If you’re looking for a meal with the taste of fall flavors or a tasty way to eat more grains and vegetables, look no further than this burrito from Veggies Don’t Bite. With Brussels sprouts, butternut squash, brown rice, apples, and pistachios, this concoction is packed with healthy ingredients ready to dip into a homemade raspberry mayonnaise. Jackfruit has become a recent star of the vegan world, taking the place of meat in many recipes. 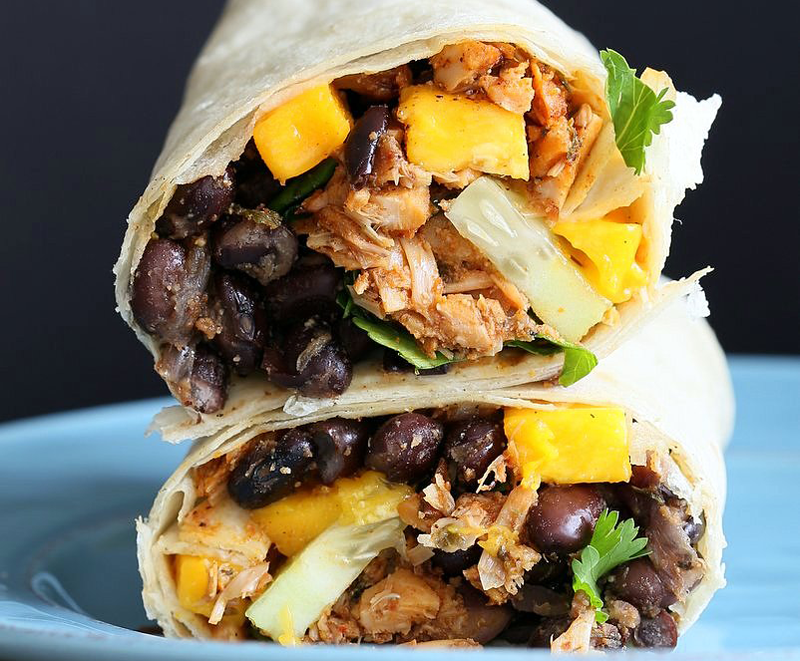 For this dish from Vegan Richa, homemade Jamaican jerk seasoning, mango, black beans, and cucumber give the burrito a Caribbean feel … even when you’re thousands of miles away from the islands. Sadly, this burrito is not a recipe, but it just sounds too good not to include. 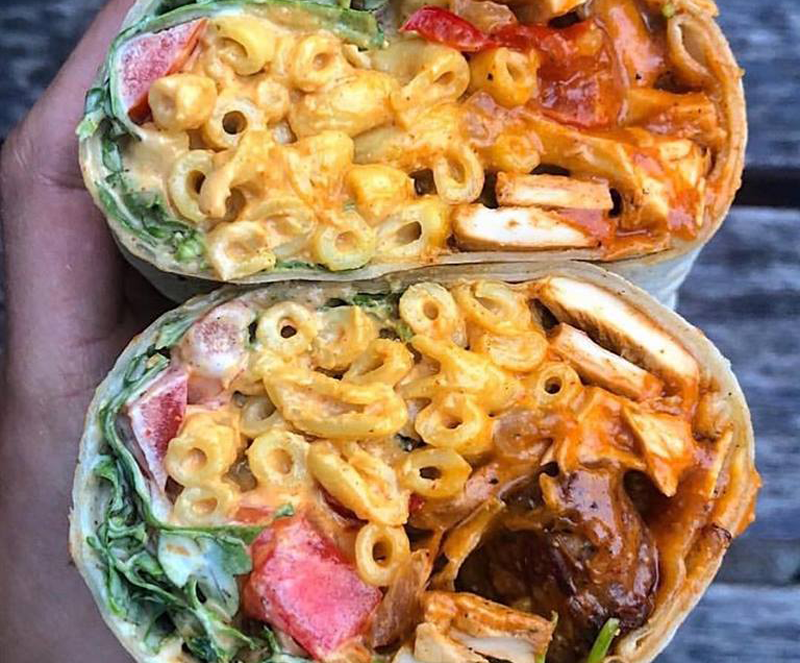 From famed vegan food truck Homegrown Smoker in Portland, OR comes this burrito filled with smoked chik’n, tempeh bacon, macnocheese, mozzarella, grilled peppers, onions, spicy buffalo sauce, ranch, and tomatoes. The Bánh mì has quickly become another popular hand-held meal perfect for those on the run or fond of food trucks. These mushroom Bánh mì burritos from Pickles & Honey offer plenty of alternatives for those who prefer to use tofu in place of the marinated mushrooms, collard greens instead of the tortilla (for a gluten-free version), or quinoa instead of brown rice. The options are endless, but each result is totally tasty! Hayden Seder is the Content Editor of SVPN Magazine in Sun Valley, Idaho and has been vegan for 14 years.